According to Wikipedia, water hammer is defined as "a pressure surge or wave caused when a fluid (usually a liquid but sometimes also a gas) in motion is forced to stop or change direction suddenly (momentum change). A water hammer commonly occurs when a valve closes suddenly at an end of a pipeline system, and a pressure wave propagates in the pipe. It is also called hydraulic shock." The following video, courtesy of Spirax Sarco USA, dramatically demonstrates the principle behind water hammer and its potentially devastating effects. A quick video showing the basic operation of a metal body, diaphragm valve for industrial applications. The video illustrates how the metallic lower valve body is machined for a smooth controlled flow characteristic, and how the elastomer diaphragm is controlled by the liner movement of the valve stem. Full open, full closed, or proportional flow is controlled by the relationship of the valve diaphragm and valve body. Metal body diaphragm valves are available in many metal alloys such as brass, cast steel, and 316 stainless steel, with many different elastomers including EPDM, PTFE and Viton. These valves are great for inert and corrosive liquid and gaseous media, are highly resistant to chemicals, are insensitive to particulate media and offer a compact design (ideal when space is at a premium). A shell and tube heat exchanger is a type of heat exchanger consisting of a shell (a pressure vessel) with a tubing bundle (or core) inside. Two fluids are used, one inside the tubing and one outside the tubing, to change temperature of the fluid contained in the shell. The amount of surface area provided by the tubes determines the efficiency of the heat transfer, and is sometimes augmented by additional lengths of tubing, or with fins. 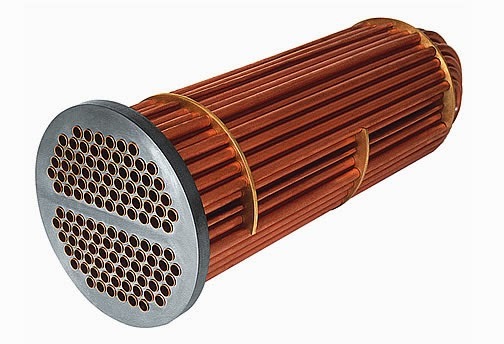 The function of a shell and tube heat exchanger is very basic. Two different fluids, physically isolated from each other, and at different temperatures, are allowed to transfer thermal energy from one to the other through thermal conductivity. Cooling Range The difference in temperature between the hot water entering the tower and the cold water leaving the tower is the cooling range. Approach The difference between the temperature of the cold water leaving the tower and the wet- bulb temperature of the air is known as the approach. Establishment of the approach fixes the operating temperature of the tower and is a most important parameter in determining both tower size and cost. Drift The water entrained in the air flow and discharged to the atmosphere. Drift loss does not include water lost by evaporation. Proper tower design can minimize drift loss. Heat Load The amount of heat to be removed from the circulating water within the tower. Heat load is equal to water circulation rate (gpm) times the cooling range times 500 and is expressed in BTU/hr. Heat load is also an important parameter in determining tower size and cost. 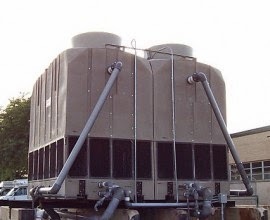 Ton An evaporative cooling ton is 15,000 BTU’s per hour. Pumping Head The pressure required to pump the water from the tower basin, through the entire system and return to the top of the tower. Makeup The amount of water required to replace normal losses caused by bleed off, drift, and evaporation. Bleed Off The circulating water in the tower which is discharged to waste to help keep the dissolved solids concentration of the water below a maximum allowable limit. As a result of evaporation, dissolved solids concentration will continually increase unless reduced by bleed off. Here are very handy conversion calculations for engineering and process control. You may want to bookmark this page for fast lookup. Steam is used in many industrial processes today. It is used in the production of our food, textiles, chemicals, power generation and many other manufacturing systems. Steam is a major energy source for industry because it is cheap to create and easily transported through pipes. It can be used to provides energy for process heating, or it can provide energy to mechanical drives. Steam uses energy in form of heat, which can be converted into other forms of energy. For example, in a power plant, steam is a medium that converts heat energy into mechanical energy (pressure that spins a turbine) and that mechanical energy is then converted into another useful form of energy - electricity.